Lego's minifigures have gone crazy. As small simple figures intended to accent the Lego brick system playsets, they have morphed into a huge profit center for Lego, besides creating an ecosystem around them supporting myriad other companies to scratch the minifigure itch. Lego themselves have made 4 billion minifigures, and other companies, such as Brick Arms, have made large numbers of custom figures. Legos are not just for kids... 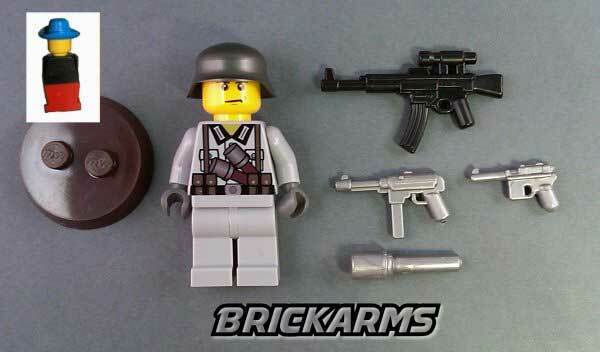 Brick Arms was founded in 2006 to produce WW2 themed minifigures and weapons. The demand hasn't slowed down a bit, and collectors clamor for more. They make weapon packs that feature almost any weapon, and their figures are constantly being updated, with one of the latest, Shaun UK Zombie fighter, catering to the Zombie craze. Lego battles populate YouTube. One of my favorites is from Dino5500's channel, and follows the movie "Stalingrad", even down to arming only one in five Russian Lego soldiers. They should call Brick Arms for supplies.